UPDATE 2011: When I interviewed Iotah in 2008, after they won the Macedon Ranges Push Start Battle of the Bands contest, I was struck by both their maturity and eclectic taste in music – lots of Hendrix and Zeppelin style rock, but all the new alternative sounds, too. 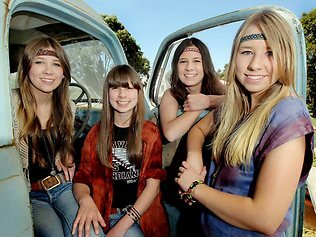 I was stoked, but not surprised, when the girls beat bands from across Australia to win Triple J’s Unearthed High contest, earning them a day’s recording time in Sydney and a free concert at Holly’s new school, Gisborne High, playing backup to rising Melbourne band British India. Since then they have enjoyed growing airtime on Triple J and, despite having to change their name to Stonefield due to a clash of naming rights, have a huge fanbase across Australia and growing media presence. A residency at iconic Melbourne venue the Tote and an invitation to play at the UK’s classic festival, Glastonbury, are the next steps on their broadening horizon. On a windswept hill just outside of remote Darraweit Guim, a shed pulses to the sounds of slick, solid rock. It’s being produced by the four music-loving sisters of award-winning bank Iotah, who are working on their distinctive form of old-school rock. Citing Led Zeppelin as an inspiration, the girl – Amy, 18, Hannah, 15, Sarah, 14, and Holly, 10 – have been playing together for about three years and have a remarkably democratic work ethic. While Amy, the lead vocalist and drummer, writes most of the lyrics, the rest is collaborative. “We all do a little bit; like if I come up with something on the guitar, we’ll work out some stuff around that,” says lead guitarist Hannah. “Yes, but we also give each other ideas,” adds keyboardist Sarah. Holly, whose bass guitar is almost as big as her, started playing about three years ago, around the time her sisters also took up their instruments. 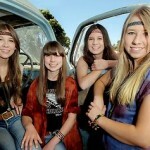 Surprisingly for siblings, the four admit they have always played and worked well together and say their parents’ choice of music was a strong influence. Last month, Iotah won the 2008 Macedon Ranges Push Start Battle of the Bands – and with it a day’s free studio time at The Sound Vault Recording Studio. They also won the Mitchell Shire Battle of the Bands. They will thrash it out against other young musos in the Push Start’s version of regional finals in October. All four practise daily, rehearse together weekly, and believe they will play together for many years. Amy is doing a bachelor of Australian popular music degree at NMIT and plans to follow that with a teaching degree. Hannah is taking VET music at Whittlesea Secondary College and Sarah, also at Whittlesea, has also chosen a musical elective. Holly is at Darraweit Guim Primary School. With several live perforance behind them – from 50th birthday parties to school fund-raisersj, open mic sessions and at the Youyth Week finale in Broadmeadows earlier this year – their next challenge is against about 400 bands in the worldwide Emergenza contest. Dozens of Victorian hopefuls will plan int ehfirstround play-offs in Richmond in June and Jly for the chance to represent Auastralia at the international finals in Germany and, ultimately, win six weeks’ paid studio time in Sweden.